Christmas Gift Guide | Beauty Gadgets! 1. THX Total Hair Experts Spiralicious Bubble Wand exclusively at Tesco, £25 – This crazy looking hair wand is everything you need to create a variety of hair looks! The bubble design allows you to choose from tousled waves by wrapping hair around the bubbles, or defined spirals by wrapping hair in the grooves between the bubbles. It has a temperature setting of 210 degrees and a ceramic-coated barrel, so you can create beautiful curls while protecting your hair from heat-damage, and the extra-long length of the wand means it even works on longer hair. Thumbs up all round for this nifty product! 2. Foreo Luna Mini from Lookfantastic, £99. – The Luna Mini is one of the latest gadgets on the skincare scene. You use this product for only one minute morning and night to drive away blemish-causing impurities. The Luna Mini promises to leave the skin looking clearer, brighter and healthier in just 3 days! It gives up to 8000 pulsations per minute to gently remove dead skin cells, as well as unclogging pores of 99.5% of dirt and oil, and 98.5% of makeup residue. The non porous silicone brush is super hygienic too as it resists bacteria buildup. The Luna Mini’s smooth, soft silicone touch-points glide across the skin for deep, effective facial-cleansing that’s actually gentle enough to use every day. Its travel-friendly design is also fully waterproof, lasts up to 300 uses per full charge and requires no replacement brushes. What more could a girl want!? 3. Magnitone Lucid Facial Brush from Lookfantastic, £49 – I’ve been using my Lucid for quite a while now with no complaints whatsoever. I’ve included this as an alternative the the Luna above, as they both effectively do the same thing. It just depends on your budget and if you’d prefer silicone or a brush head. The Magnitone Lucid has two cleansing modes for deep cleaning and also for sensitive skin, it gives 10000 pulsations per minute and is completely waterproof so you can use it whilst in the bath or shower without worrying! 4. ghd V Coral Styler from Lookfantastic, £109 – If anyone mentions hair straighteners, the first brand most people will think of is ghd. They’re renowned for their superior quality electrical hair products, and the Coral Styler is up there with the best of them. Helping you to create hair styles you’ll love, the ghd V Coral Styler has been designed with vibrant hues and graduated colours to give you an exotic styler that allows you to create flawless looks. The straightening irons have been designed with contrast black plates that contain ceramic heat technology to enhance shine and versatility. Ideal for straightening, curling, or adding waves and flicks, the V Coral Styler has a rounded barrel to help you to create endless styles with ease. The Styler also has a professional length cord for flexible styling, an automatic sleep mode after 30 minutes and a coordinated heat resistant mat, so you can style your hair to perfection. 5. Panasonic EW-DE92 Toothbrush from Boots, on sale at £99.99 until January 7th. Electric toothbrushes often tend to be on the expensive side so people may not necessarily be keen to run out and buy one, they are a fantastic investment though so this Panasonic toothbrush (which is currently half price) really would make an excellent Christmas gift! The new EW-DE92 model toothbrush features Ionic technology that takes care of stains and plaque, it also has a triple-edged brush and sonic vibration of 31,000 brush strokes a minute! 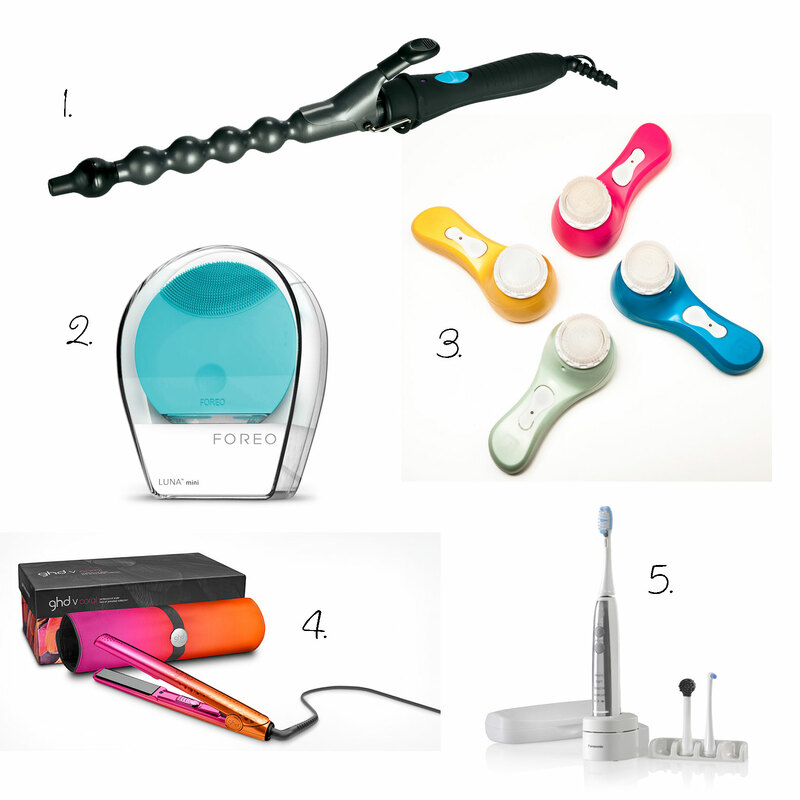 You also get a load of extras in the box including point brush and gum massager attachments and a handy tongue cleaner. The EW-DE92 toothbrush also has four selectable brushing modes and a soft start function. This toothbrush really is the bees knees of dental hygiene, make sure you grab one while they’re on offer! Next Post NEW Makeup Revolution Euphoria Bronzed Palette!